IN the world of traditional knowledge, one’s lineage is very important. Who was your teacher? What school are you from? To whom are you responsible? What elders have taken responsibility for you? 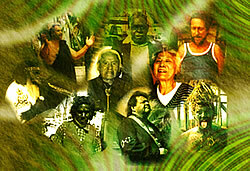 John Stokes, founder of The Tracking Project, began his work with Aboriginal Australian communities in the late 1970’s. He soon realized how much knowledge and wisdom traditional Native elders were carrying and how much this knowledge needed to be preserved, not only for the Native communities, but for all people. Especially important was the knowledge related to the Natural World. The Native elders were aware that the traditional knowledge needed to be preserved in a way that would make it useful in the modern world. Many were very specific about how the knowledge should or should not be used; others were happy just knowing that the knowledge would survive. One common desire was that the knowledge be given back immediately to their own young people, so that “our children will not be the last to learn of their own culture.” The Tracking Project’s community programs evolved from the wishes of these teachers. We are honored to present our teachers.